Yesterday , work started on our village for this year .. This was last years and it was amazing! 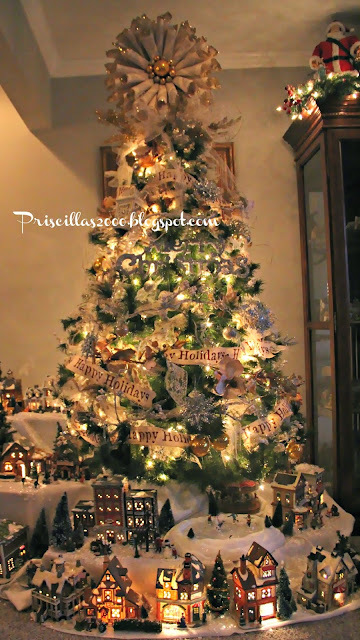 It is one of my most popular blog posts ! 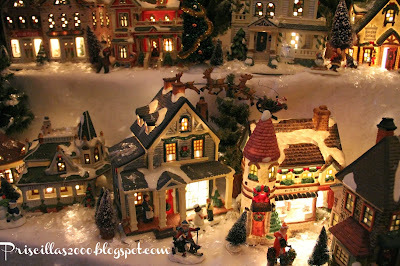 I aquired a "bunch" of new houses this year at the GoodWill.. so this years village will be bigger and better !I can't wait for it to be finished so I can show you ! 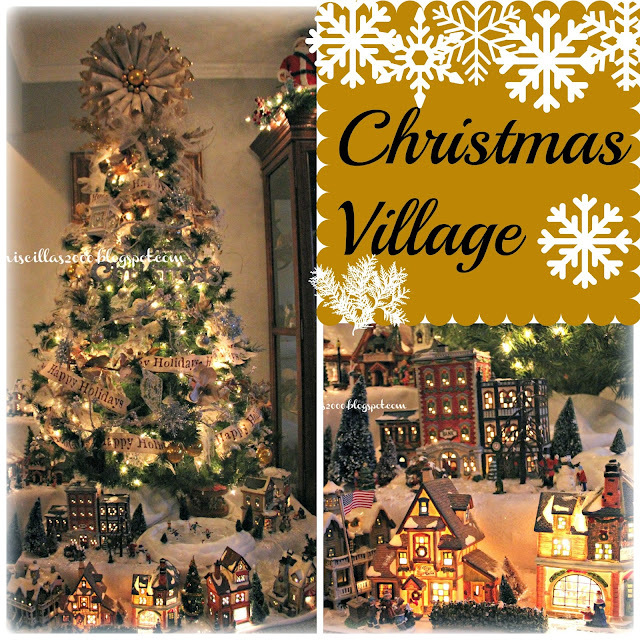 Click here to see the 2014 Christmas Village that is twice as big !! Hi Priscilla! Oh, I love your lovely display of your little village houses! You have a city! 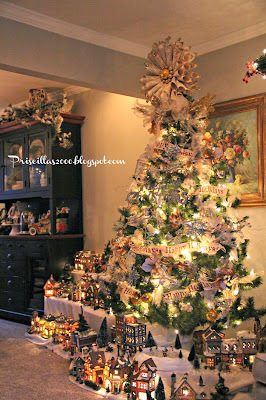 :) Your tree is truly gorgeous too. Thanks so much for popping in to see me and your sweet comment. Oh my. I love your village. I had a large one, but gave it to my Daughter when she bought her home. I do have a small one right now. 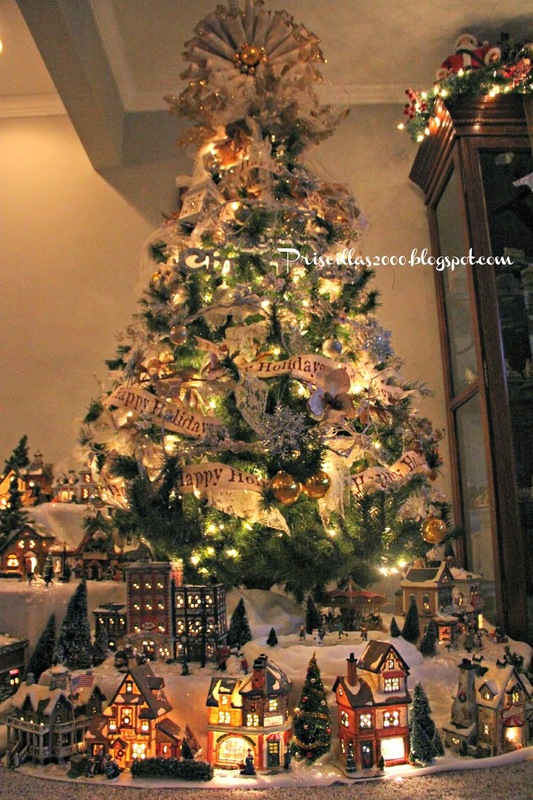 Oh your village and tree are stunning. 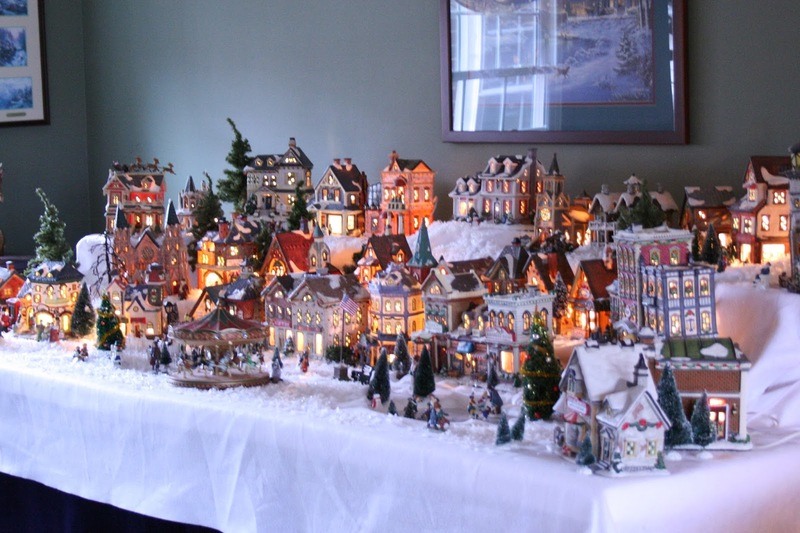 I have villages also, but I am not putting them up this year. I live alone and it's just to much work to do. 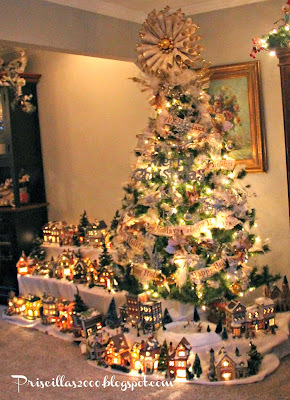 I like how you have the tree elevated and the village under it. Great job! 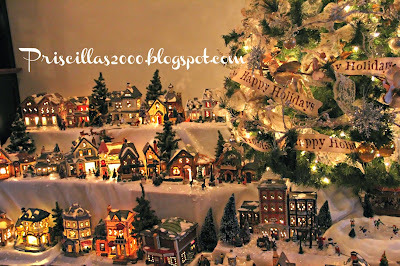 I think the village looks just perfect under the tree. A wonderful winter scene! Your village is just wonderful!!!! You will never want to pack it away!!! Its amazing, well done to you both. 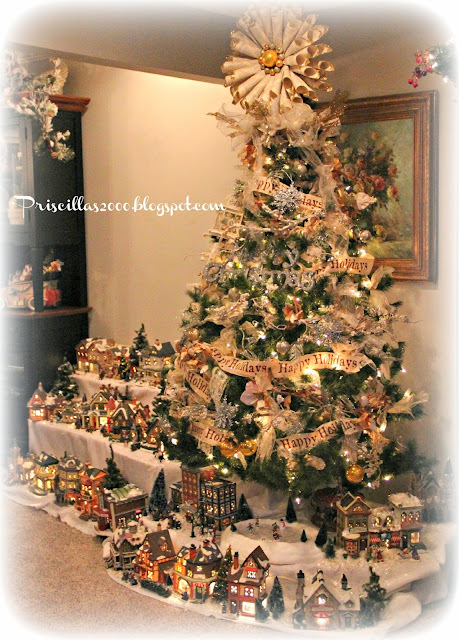 Priscilla, your tree and village are beautiful. 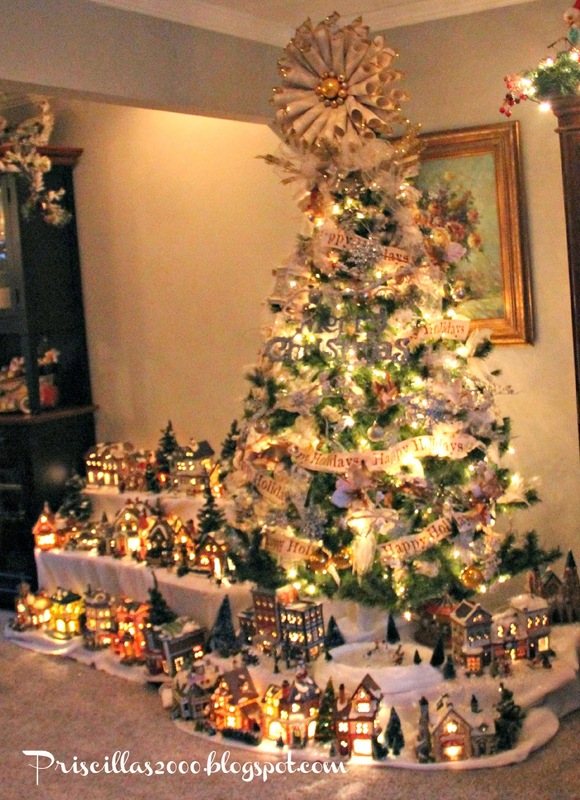 You and your husband did a fantastic display. Your home will truly be a wonderland when you are finished. I'm not surprised that Jo Ann Fabrics wants to share your creativity and talent. Your decorations are beautiful..looks amazing! Oh that is fabulous!! What a stunning display all lit up! Thanks for joining Home Sweet Home! Priscilla, it really is an amazing sight! Your hubby did a fabulous job. If I waited for my hubby to do our village it wouldn't get done. lol! I have a small collection, about 21 houses of Dept. 56. Haven't put it out since we moved to this home. Thought I might this year, but we'll see. They are a lot of work. Thanks for sharing with SYC. 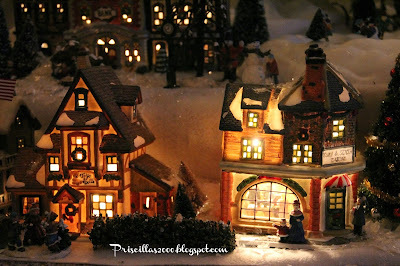 Priscilla, I love the new way you've set up your beautiful village! I collect houses too (most of them were passed to me after my mom passed away). They are special to me and I always enjoy them!